Griffin's memory card reader works with MacBook Pro's as an adaptor that slots into the Mac laptop's ExpressCard port. It will dock five of the most common cards used on cameras, but there is no Compact Flash support. 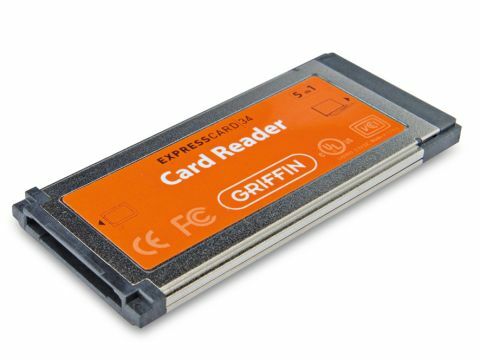 The card types it supports are Memory Stick, Memory Stick Pro, SD cards, xD-Picture cards and MM cards, and the connection is high-speed USB 2.0. It doesn't require any batteries or driver installation. In our MacBook Pro it worked as advertised and fitted the ExpressCard/34 slot well. It's a handy device for quick access to photos on memory card. For transferring files to your Mac you can get away without one of course; you can simply run a USB lead from your camera to your Mac. In the absence of either a printer or a cable, or for quicker access then this has real value. A CF option would have broadened its appeal, though.